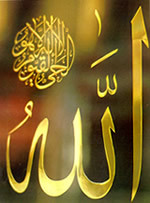 Allah, Praise and Glory be to Him, manages graciously all the affairs of the believers; only to Him could everything be entrusted, as He is sufficient to His creatures; He perfectly protects everyone who commits his soul to Him, and suffices and satisfies with His lavish endowments everyone who dispenses with everything save Him. The trustee could either be entrusted with some affairs, and in this case he is imperfect, or could be entrusted with all affairs, and this trustee could only be Allah; He is the One to Whom every minute thing is committed and entrusted; He is the DISPOSER of Affairs. Moreover, a trustee may be unworthy to be entrusted except when authorized; but He Who deserves, by His Exalted Self, that everythingand every single affair be committed and entrusted to Him is Allah, the DISPOSER of Affairs; all hearts are entrusted to Him. Furthermore,a trustee may fulfil some of the affairs committed to him, but Allahwill suffice all the needs of His creatures without the slightest defect. Allah protects His creatures for He is the Best DISPOSER of Affairs; He says, “Men said to them: a great army is gathering against you, and frightened them. But it only increased their Faith, they said: For us God sufficeth and He is the best Disposer of affairs. Andthey returned with Grace and Bounty from God, no harm ever touched them,for they followed the good pleasure of God” (AL-I-‘IMRAN, 173, 174); He disposes the affairs of those who have no trustee, He says, “And He hath power to dispose of all affairs.”(AN‘AM, 102), “No reason have we why we shouldnot put our trust on God. Indeed He has guided us to the ways we follow” (IBRAHIM, 12), “Then when thou hast taken adecision put thy trust in God, for God loves those who put their trust inHim.” (AL-I-‘IMRAN, 159), “Say, not mineis the responsibility for arranging your affairs.” (AN‘AM, 66). The Arabic word wakeel is derived from wakalla which means (to entrust someone to do something), hence wakeel may also mean (the one who helps and protects), “Behold! We shall entrust their charge to a new People who reject them not.” (AN‘AM, 89), “..if ye do really believe in God, thenin Him put your trust if ye submit your will to His” (YUNUS, 84). The absolute reliance and submission is the complete dependence on whoever is entrusted to be in charge, and to be contented with theconsequences no matter how undesirable; hence the one who is truly andrightfully the DISPOSER of all Affairs is Allah, Praise and Glorybe to Him, He is Allah.